World of Warplanes 2.0 combines the atmosphere of fierce aerial battles with legendary aircraft from the 20th century, tactical teamwork for launching strikes on enemy territories or defending against enemy raids, and a strategic approach to the distribution of team efforts between key territories. In the new "Conquest" game mode, victory depends not on the number of destroyed enemy aircraft, but on a team’s ability to capture and hold key territories on the battlefield. Each territory serves a particular function, has its own defence system, strengths, and weaknesses, based on which teams should set priorities for attack. Since destroying aircraft is no longer the key to victory, losing a plane in battle is no big deal. During a battle, players can fly several sorties, including sorties with different aircraft models. Simple and easy to understand flight and firing mechanics allow players to concentrate on the aerial action. There are five aircraft types available in the game, including bombers. So every player will be able to find a suitable playstyle and make their own contribution to victory. A new battle interface, reworked camera modes and graphics, a totally new approach to assessing the performance of players in battle—aerial combat has never been so exciting. In the new World of Warplanes mode known as Conquest, victory is achieved through assaulting and establishing control over fortified and defended key territories on the battlefield, in order to gain a tactical advantage over the enemy. Controlling any such territory provides the team with a specific number of influence points if held for a specific timeframe. The team that gains the necessary amount of influence first, wins. Territories of different types provide additional advantages to the controlling team: airfields allow players to repair their aircraft and choose a respawn point, manufacturing facilities increase the number of influence points earned, while command centres and military installations attack the enemy territories and make it easier to capture new territories. Once update 2.0 is released, the old "Superiority" game mode from World of Warplanes 1.X will be disabled. After the update is released, no changes will be made to the player accounts. All assets, including researched and purchased aircraft, Free XP, aicraft and crew XP, credits, gold, consumables, ammunition belts and equipment will remain. The statistics will be moved to a separate archive tab in the Profile. After the release, battle statistics will once again start to accumulate. To familiarize players with the basics of the new "Conquest" mode and the roles of the aircraft classes, a chain of easy training missions was added. Players who complete them will be rewarded with gold. Generally, influence points are added to the team’s score once every 5 seconds depending on the number and type of territories controlled by a team. If one team gains control over all the territories on the map, a superiority state begins where the frequency of influence accumulation is significantly increased. Each territory in the area of operation provides specific advantages to a controlling team. A respawn point (players can select this territory to respawn there after their aircraft is destroyed). Enables players of the controlling team to change aircraft model and type. Players can select an aircraft from their Hangar that is ready for battle and suitable for the specific battle level, once in the tactical screen. Decreases respawn time by 10 seconds for all players of the controlling team. Provides 80 influence points every 120 seconds. If a territory is captured by the enemy team during the countdown, the countdown starts again. Calls in an Attack Flight of five bombers for assaulting an enemy territory (except neutral territories) every 110 seconds. The Attack Flight approaches from outside the area of operation towards the targeted territory and bombs it, dealing significant damage. The amount of damage depends on the number of bombers that reach the target. After that territory is captured, the Command Center targets the next available territory. Bombers of the Attack Flight can be intercepted and destroyed by enemy aircraft. At the start of a battle, all key territories in the area of operation are neutral and controlled by local defence forces. In order to establish control over the territory, a team needs to destroy targets inside it (ground objects, air defence aircraft, and enemy team aircraft) and earn capture points (CP). The progress towards capturing territories is displayed on their icons. Once a territory is captured, all attempts by the enemy team to recapture it are blocked for 30 seconds. Players can track the progress towards capturing territories with the help of circular progress bars on territory icons. Once a territory is captured, all attempts by the enemy team to recapture it are blocked for 30 seconds. The defence system’s composition and numbers depend on the territory type. For example, the airfields have virtually no AA artillery, while the military installations are heavily fortified. The efficiency of different aircraft types in capturing a territory directly depends on the type of a territory and the composition of its defence system. In the Conquest mode, losing your aircraft does not mean the end of the battle for you. After a short pause, you can re-enter combat with a new aircraft. Each type of airfield territory can serve as a respawn point. 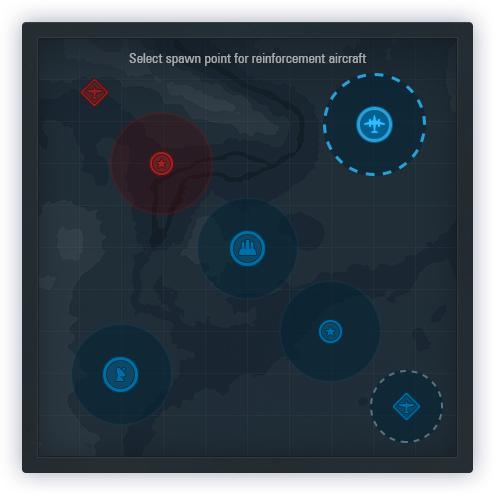 Once the allied team captures at least one such territory, you can choose a preferred target area for your next respawn in the tactical screen while you wait for your next aircraft to be ready for battle. The minimum respawn delay is 10 seconds. Every subsequent destruction of the player's aircraft increases this time by 15 seconds. Every airbase controlled by a team decreases the respawn time for this team’s players by 10 seconds down to the minimum delay. 7 minutes after the start of a battle, a “squall line” gameplay event begins. After that, respawning will no longer be possible and the teams will fight until one of them reaches the required amount of influence or one of the sides loses all of their aircraft. A heavily damaged player aircraft begins to partially regenerate its HP once it reaches safety (away from enemies and not taking damage). The repair process is gradual. Its speed and maximum amount of restored HP depends on the aircraft type and amount of damage it had sustained. Critical damage cannot be restored in this way. The bombs are dropped several at a time by pressing spacebar. For more accurate and natural gameplay on this aircraft type, a special bombsight mode is available. By activating it with the left shift, a player will find themselves looking down on a target through the targeting optics, and an autopilot will be engaged. The bombsight mode allows for more precise bombing and quickly determining a target’s type. To switch to this mode, press Left Shift. Ground target markers will be more detailed and you can adjust your flight path using the mouse. Bombers operate from high altitude, diving close to the ground is not recommended. The main drawbacks of this type are low manoeuvrability and weak forward-facing armament that make it easy prey for enemies in a dogfight. Once all parts of a bomber have been collected, the player will receive it at no cost. At some point before the end of the event, missing parts will be made available for purchase with tokens. Once the event is over, all three models will be available in in-game shop as premium aircraft. The "Special Project" is meant to be a presentation of the new class. In the future, full branches of this class will be added in the Tech Tree. In the Conquest game mode, team victory is defined not by individual player skill or the capabilities of a single aircraft, but by the team’s overall ability to destroy territorial defences, capture and control territories, and fend off enemy counterattacks. Each aircraft type has a role in which it excels. Attack aircraft and other machines equipped with heavy armaments are crucial for the quick destruction of ground objects and securing territories. Fighters are best for fast air defence suppression and the defence of controlled territories against enemy counterattacks. Fighters are very maneuverable and dynamic aircraft with easy-to-use weaponry. Attacking territories with powerful AA defense systems and intercepting bombers and attack aircraft is made harder due to the low durability. The main mission of fighters is defending territories against enemy attacks and quickly destroying light aircraft. Multirole fighters are universal aircraft with average weaponry that can carry some bombs or rockets. Their main mission is breaking through enemy air defenses, conducting precise attacks on ground targets as well as defending against heavy fighters, attack aircraft and bombers. Heavy fighters are fast aircraft equipped with powerful forward-firing weapons and a significant number of rockets or bombs. Long powerful boosts and good climb rates allow them to quickly move on the battlefield. THis class should intercept and destroy both attack aircraft and bombers. They should also conduct precise attacks against ground targets and support allied aircraft when capturing territories. They low maneuverability and large size make them vulnerable in close-range fights against fighters and multirole fighters. It is recommended to escape the effective firing ranges of enemies at high speeds and using the rear guns against them (by pressing T). Attack aircraft are extremely durable machines with a powerful arsenal of forward-firing and outboard weapons. This class should destroy ground targets at low altuitueds and support the capture of all territories. They are very resilient thanks to their high durability and the rear guns which can be controlled manually by pressing T. However their low maneuverability and speed as well as the large size are weaknesses. Bombers are heavy, high-altitude aircraft with high durability. They can destroy ground targets by dropping bombs from high altitudes. Their long boosts and excellent altitude performance let them quickly take up positions above enemy territories where they destroy targets by accurately dropping their large bomb load using the bombsight (enabled with Left Shift). Their large size and low maneuverability make them unfit for dogfighting but the high cruising altitude and powerful rear guns make them very hard targets for most fighters. Aircraft flight characteristics (their manoeuvrability and engine power) depend on the flight altitude. It is easy to evaluate the potential of the plane you are flying based on the altitude and airspeed readings in the battle interface. Now flying at any altitude within the range between ground level up to the optimum altitude (different for each aircraft model) means the aircraft will be at maximum manoeuvrability. Exceeding the optimum altitude will bring a noticeable decrease in flight characteristics, while approaching the altitude ceiling will decrease them further to a point where they will be sufficient only for level flight. The battle interface conveys this information through colour coding of the numbers on the altimeter: they are white at optimum altitudes, orange when exceeding the optimum altitude, and red when flying close to the aircraft's ceiling. Similarly, manoeuvrability depends on the flight speed: when approaching critical values, a risk of stalling or losing control appears, when exceeding the optimum airspeed (in case of diving), manoeuvrability is significantly reduced. These are the main keys used in battle. You can find the full list of all keys used in the game in the settings. To inflict damage on an aerial target with forward-firing armament, it is necessary to consider its direction, its approximate airspeed, and the parameters of the armament equipped on your aircraft. Correct your aim based on tracers, flashes, and the sound effects of hitting targets, as well as special indications on a target marker. Since projectiles of forward-firing armament have a terminal velocity in the game, it is necessary to lead the target, i.e., shoot ahead of a target at a point where the target and projectile will collide. Depending on the calibre and type of forward-firing armament, its effective range is different. Red numbers showing the distance to the target is an indication of it being inside the effective shooting range of the main weapon. This means that shooting and hitting the target will be effective and deal damage. In all cases except head-on approaches or shooting from directly behind a target, the optimum aiming point is located slightly ahead of an enemy aircraft. In order to make aiming easier, the tracers and flashes as an enemy aircraft is hit were made more distinctive. This allows players to see the trajectory of their projectiles and the point where it connects with the enemy's flight path. It is necessary to find the appropriate lead compensation based on the armament calibre and projectile velocity. Damage caused by forward-firing armament varies from minimum, if fired at the maximum range to the target, to maximum, if fired in close combat. Apart from losing HP due to hits, an aircraft can also catch fire or sustain critical damage to certain modules: wings, tail, fuselage, and engine. Critical damage reduces aircraft performance dramatically: damage to the tail assembly and fuselage reduces manoeuvrability, damage to the engine—thrust, airspeed, and boost efficiency. Besides this, enemy fire can injure the crew. An injured pilot is not capable of firing accurately and an injured rear gunner stops firing the rear gun. To achieve maximum efficiency in a dogfight, it is recommended to aim at the most vulnerable aircraft parts to cause critical damage. In the Conquest mode, player performance is assessed and the reward is calculated based on mastery and combat points earned in battle. Team efforts (filling the influence meter by 25%, 50%, and 100%). Special actions (for example, destroying an enemy aircraft by ramming it or shooting it down with a rear gun). The number of mastery points earned in a battle directly affects the amount of experience that aircraft and crews receive after the battle. If a player uses several aircraft in a single battle, the experience is awarded to all of them and their crews based on the number of mastery points earned while piloting each of them. Victory awards additional experience. Dealing damage to and destroying air defence aircraft and Attack Flight bombers. Participation in the capture of enemy territories and defence of territories controlled by the allied team. The cost of repairs for an aircraft depends on the number of times it was destroyed in a battle. Consequently, saving the warplane and repairing it over the airfields controlled by the allied team allows players to reduce their expenses significantly. If a player uses several different aircraft in a battle, expenses for their repairs are calculated separately. The payment for using ammunition and consumables, whether in credits or gold, is deducted after their first use in battle: the first weapon fired, bomb dropped, rocket launched, or consumable used. The ability to respawn and re-enter battle does not affect expenses—they are only deducted once per battle. Any consumable can be used many times per battle; but they are balanced with cooldown timers between uses. Consumables available for gold are activated either automatically or manually depending on their type, have an unlimited number of uses, and a delay of 60 seconds between each use. This delay is reset when the aircraft is destroyed and respawns. Since the outboard armament is gradually replenished in the new game mode, the first bomb dropped or rocket launched now costs the same amount as a full load of that kind of armament. If a player uses several different aircraft in a battle, expenses for ammunition and consumables are cumulative. In the centre of the screen, under the influence meter, there is an icon for the territory where a player's aircraft is currently flying and the status of the territory. Aircraft durability is displayed as a bar directly below the aircraft. In the bottom centre of the screen, there are indicators showing the number of mounted rockets and bombs (for aircraft with the ability to carry outboard weapons) and the indicator of the time required to replenish the rockets and bombs. In the bottom left, there is an aircraft layout showing whether there is critical damage to aircraft modules, how ready the mounted consumables are for use, and how overheated the forward-firing armament is. Besides this, the state of an aircraft can be quickly evaluated by the following graphic effects: smoke and sparks indicating damage, screen darkening, oily traces indicating critical damage, etc. Every detected target is indicated by a special marker that allows the player to quickly understand the type of the aircraft (e.g., fighter or heavy fighter), the kind of target (e.g., an enemy team aircraft or air defence aircraft), type of ground target, etc. Upon destruction of a player's aircraft the camera switches to the enemy aircraft that shot it down. This allows for better opportunities to analyse tactical errors and coordinate with a team during battle. The spectator camera has a cinematic mode that automatically chooses and shows cinematic perspectives, and a mode for manually tracking certain aircraft. If a player's team controls the airbase and the “squall line” gameplay event has not started yet, at the bottom of screen in the Spectator mode, players can select an aircraft from those available and suitable for returning to battle.